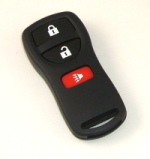 We have NEW, Black, OEM casings for the remote control of your Nissan Altima. This is the casing only and is a great replacement if your buttons rub out of the keyring hole of your remote control is nearly broken! Shipping is only $2.95 via first class mail within the USA & Canada on this item. We are now including a brand new battery for each remote shell you purchase!